The New Year’s Eve meal was a success with one exception. The texture for the pupusas, a thick cornmeal disk with bean filling was much trickier than expected. Mine ended up way too thick and doughy. This was probably the penalty for adding too much water. 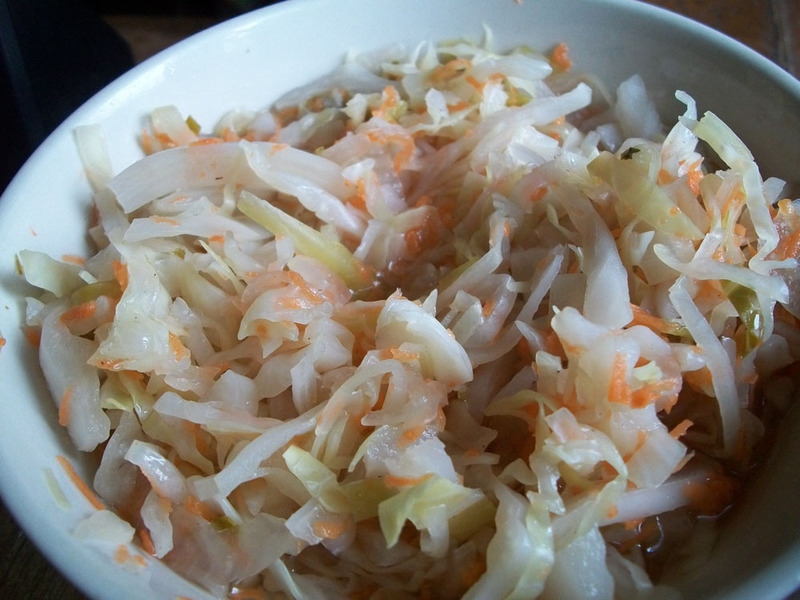 The accompanying vinegar coleslaw, known as curtido turned out perfect however. We’d tried several other recipes in the past which came out too crunchy or too cabbage-y. The successful recipe was pulled from Vegetarian Times. The only change was to add an extra spoon of sugar. Note: Curtido is vegan and gluten free. Next week, I’ll give an updated pupusa recipe along with the RoodonFood spin on filling. After the meal we went up to Prospect Park to catch the fireworks. It was chilly but pleasant. The display of light didn’t disappoint. We brought along a thermos of warm chamomille. Hey Kate. Thanks for the comment and happy new year! I love pupusas too. I hope to do them justice with a recipe in the next week or two. I trust all is well up in Toronto. Cheers.